WARNING: This is a RANT post! Proceed with caution! But do not hesitate to comment for constructive conversation/debate. I cannot stress just how much I abhor the retractable leash. To recap, here’s my original post. All too often I see countless dog owners walking with their dog or showing up to the vet office with their dog on a retractable leash. The dog is 99.99999% of the time tugging at the leash (because a retractable leash teaches them to do so). This is not a habit you want your dog to think is OK. Especially if you have a very large, muscular breed dog. All dogs should be taught proper leash manners. Not only do these leashes teach a dog poor leash manners, the mechanisms in these types of leashes are NOT foolproof! They fail more often than not. Of all of the clients I deal with that come in to the animal hospital with a dog on a retractable leash, more than 50% of the time the locking mechanism of the leash is not working. That potentially puts 1) the dog on that leash, 2) the other animals in the area, 3) the pet owners in the area and 4) the staff of the animal hospital at risk of injury. It doesn’t matter how friendly or social your dog is, retractable leashes that are failing or unmonitored are tripping hazards! Also, your dog might love cats, but that cat waiting in the lobby isn’t necessarily fond of your dog. If you think that you are exempt because you never let your dog wander, your dog is well-behaved on the retractable leash, and you always make sure your leash is in good working order…my recommendation is…then why not just get a real, reliable, SAFE-for-everyone leash?!! Having worked in the animal care field for over 20 years now, I have learned a great much about animals and their health and well-being. I am fairly well acquainted with most pet toys and gadgets too. Some are great, while others make me think “what in the heck were they thinking when they developed this thing?” Retractable leashes are one of those gadgets that make me cringe. I truly hope they, along with chain leashes, go the way of the dinosaur. Retractable leashes are leads with plastic handles that contain a reel system. As a pet advances, the leash unreels and the pet is able to move farther from the handler. If the handler wishes to stop the pet from being able to advance, the handler typically has to push a button that “locks” the leash to prevent it from unreeling. The only way that the leash can shorten is if there is some slack between the leash handle and the pet. The first 12 to 24 inches of most retractable leashes is a flat nylon-type material. The rest of the length of these leashes is typically a thin cord. In some cases the entire length is a thin cord. I can understand only one benefit of the retractable leash. Oh. Wait. I lied. Why am I so down on these ever-so-popular gadgets? Let me tell you! They teach your dog to pull. If you have a tiny little teacup chihuahua at the end of a leash, the pulling isn’t usually a big deal. However, if you have a 75 pound lab or a 120 pound mastiff pulling at the other end of a leash, you’re going to have some pretty serious control issues there! Teaching your dog leash manners is crucial in any case, but especially when it comes to muscular breeds or large and giant breed dogs. The locking mechanisms are not trustworthy. As your pet pulls at the retractable leash to check out the flattened squirrel in the street while a car is approaching, are you going to trust that little plastic latch to save your dog from being struck by that oncoming vehicle? I sure wouldn’t. And for good reason. I’ve seen what happens in such a case far too often. The thin rope cord is dangerous to you and your dog. Imagine, if you would, the following scenario: A woman is taking her 60 pound pointer for a walk in the park when a squirrel crosses the dog’s path. The dog begins to chase the squirrel so the woman attempts to press the “lock” button, but the momentum created by the dog is able to overcome the lock! In a panic the owner reaches and grabs for the leash. BIG MISTAKE! There are cases of dog owners losing fingers in cases similar to this. At the vet clinic: All too often I see pet owners come into our office with a dog on a retractable leash and that dog begins to explore the entire waiting area! We see both healthy and sick patients at the office. I don’t want your healthy dog fraternizing with another waiting sick dog, or otherwise. Also, your dog’s roaming creates a snag-line to other patrons or staff members! These are my top 4 reasons for banning retractable leashes, but I could easily come up with 20 more reasons to ditch them. Folks, if you have a dog, you need to properly leash train that dog. If the dog pulls or is too “strong” for you, please talk with your veterinary staff about head halters or no-pull harnesses. Time needs to slow down. No, really. I’m serious. It’s going by WAY too fast. A lot has happened since I last blogged, which is why I haven’t blogged in so long…no time! If I could just get another 8 hours added on to every day I just might have enough time in a day to get everything done that I both need AND want to. Unfortunately, that will never happen. So I’ll just have to keep on doing the best I can. In May of this year I stumbled upon another group fitness opportunity, thanks to some info provided to me by my Pound Master Pro. It is called Soul Body Body Barre. After hearing about it I immediately had to learn more. I went to their website and looked around, watched the videos and knew that I had to learn how to teach this! A mindfully intense, full-body workout that pulls from the practices of barre, yoga and pilates, and incorporates a lot of body weight training. This particular class uses a ball and a body bar in pre-choreographed routines that are suitable for any and all fitness levels. As soon as I heard about a training opportunity that was within a reasonable distance for me, I didn’t hesitate to sign up. About a week prior to training, the instructor emailed information about the class, along with an instructional video to teach us the structure and choreography. I immediately got to work. I printed out my notes and started the video. I made it through the warm-up with no problem! Then the first real track came on. I made it through, but had to modify my technique drastically, and honestly started to wonder if I could teach a class like this. Then the second track, and third, and so on…Wow! That was one intense workout! I had a lot of work to do. Well, to make a long story short, I went all-in and busted my tail to complete my training because I couldn’t WAIT to bring this to my community! After taking the certification course I had to submit a video of me teaching a full-length class as my “practical exam.” I had a month to submit a video after the certifying course, but I jumped right on it and one week and one day later my video was recorded! It did take me 2 takes to get one, but I did finally get it. I have to share this little side note with you. After I completed the “final cut” video, I packaged up my laptop and when I got home the file was GONE. No joke. I panicked and just about totally lost my cool. Are you kidding me? I had to get some volunteers to be my class “guinea pigs” two days in a row, had a nearly perfect take and it didn’t save? I was almost in tears. But I took 5 minutes. Did some breathing exercises. Then went back to my laptop. I was able to find a cached file with the full length video. IMMEDIATELY saved it to my desktop, to my external hard drive, and to drop box! Crisis averted. So I submitted my video. Within a day I received an email that I had passed! Celebration time! I was now certified to teach the class and couldn’t wait to do so! Now, to find time to teach the class. It was, and still has been, very difficult to find times to make this class available due to my current full-time job that has irregular hours, and I was already trying to find more time to make Pound available. I was also teaching a SPIN class on days when I was available too. And there’s all the running. Now you see why I need more hours in my day? And I don’t even have (human) kids. Our oldest dog, Chompers, had to be put to rest on July 15th of this year. He had just turned 14 a few days prior. Chompers has had orthopedic problems his entire life, starting with Osteochondritis Dissecans when he was a 6 month old puppy. He has spent his entire life on joint supplements! About 2-3 years ago he started to slow down some and was diagnosed with arthritis in one of his front legs. He’s been on pain medication and NSAIDs since then. Eventually his back legs started to show a lack of proprioception (neurologic issues). 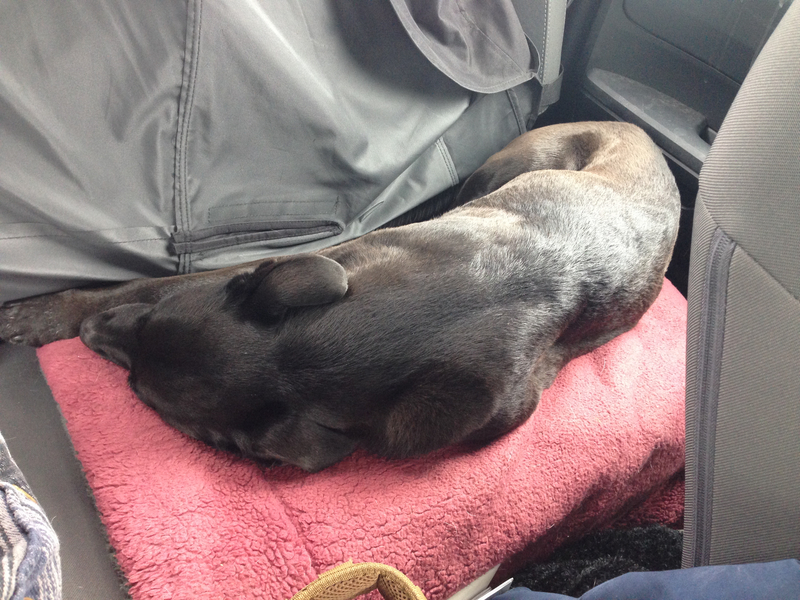 We managed him by keeping him comfortable with medications, light exercise and lots of love. In June he really started to decline and by the first of July his back end was giving out on him altogether at times. We had to make the decision when we were home with him one day and had to witness him have an episode where his back end gave out on him. He struggled to get up and was panicking because he just couldn’t. I started to wonder how often that was happening when we weren’t home. It would be selfish and unfair of us to not allow him to have a dignified farewell. So, after much discussion, we planned his peaceful departure. The day of, things couldn’t have been more obvious that the time was right. That morning, Chompers was not able to use his back legs at all. I spent the entire day with him, loved him, cried over him, and took in every last bit of him that I could. He was my heart dog and I was dreading this day for years! I cannot begin to say enough words about the company who took care of Chompers afterward. 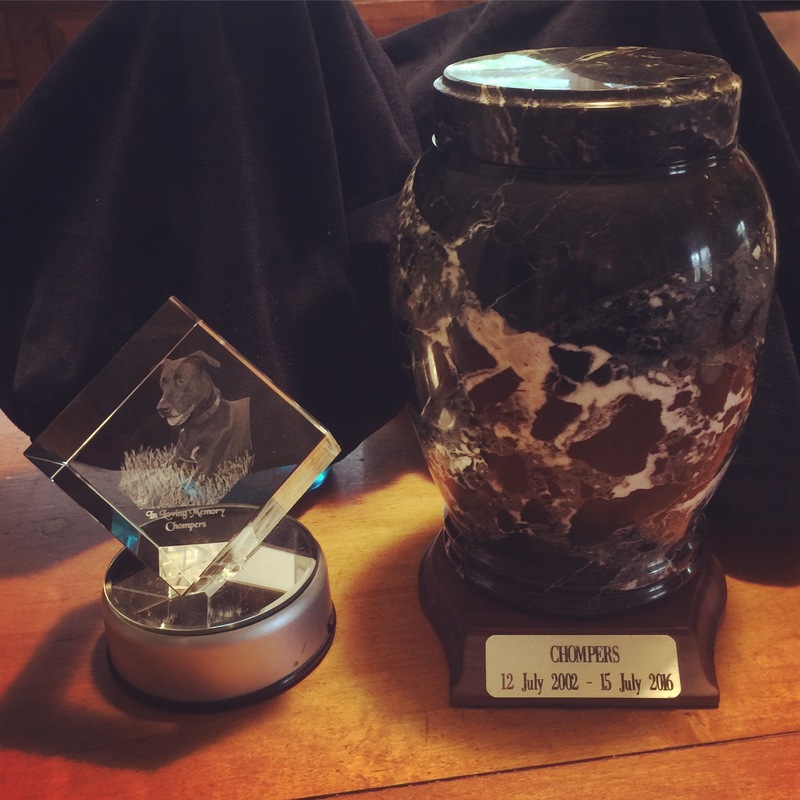 I entrusted Agape Pet Services to have Chompers cremated with his ashes returned to me. As I sought the perfect urn for Chompers on their website, I saw this glass crystal cube that you could have your pet’s image etched into it. It looked really neat and I already knew which picture I wanted to have etched! My all-time favorite picture of Chompers from back when he was 4 years old. I had to have it. And I found the perfect urn. The company was great to deal with, ordering was easy and everything was absolutely perfect upon arrival. Thanks for taking care of my boy Agape! It’s now been a few months since I’ve been teaching both Pound and, recently renamed, Soul Body Barre Unhitched. All of my time is spent now working my full time job at the animal hospital, teaching group fitness classes, trying to squeeze in some miles whenever I can, keeping current on my class choreography, every day chores and the dealings of life, and occasionally I’m able to sneak in some entertainment with my love. No time to spare. I need more hours in my day! Then a friend starts talking to me about her business as a skin care consultant with Rodan + Fields dermatologists. It sounded quite interesting, especially the part where she said she was able to free up some time from a job to do what she really enjoyed, which is teaching a Spin class to people with Parkinson’s disease (pretty cool, I know!). She asked me if I was familiar with R+F and I said of course, they’re the Doctors responsible for Proactiv. She started to tell me more about the business and asked me if I’d be interested. At first I was not. But then I thought about it some more. If I did this, I just might be able to free up some hours myself to be able to do what I really WANT to do. Even better, I could earn more money to help pay off bills, to be able to afford to visit my family in the midwest more often, and to fund my many hobbies (like running). And, what a great complement to group fitness this would be! Helping people feel their best on the inside AND outside! The more I thought about it, the more I realized that I had nothing to lose to give it a try. I know R+F, and I know they’re product lines do what they claim. So, yes, I am now trying to launch and grow my own business and I’m loving it! I love my job, don’t get me wrong, but over the past several years my passions have changed. I am still very passionate about animals. But I have become more passionate about making others feel their best through group fitness and run coaching, nutrition advice and now premium skin care. My ultimate goal is to, over the next 5 years (give or take) flip-flop my job and my hobbies. It seems to be working a little bit since I now have time to sit down and write a blog post! By the way, if you’re interested in learning more about Rodan + Fields, feel free to contact me! So that about sums it up. That’s what I’ve been up to, and if all goes well, you’ll be hearing more from me soon! Until then, hug your pets and live your best life. We got hit here on the Eastern Shore of Virginia for the second time in 2 weeks with a measurable amount of snow. This time it was the really thick, heavy, wet and pretty stuff. The kind that is perfect for making snowmen and for snowball fights! Although we didn’t do any of those things here at home today. I love the snow when it’s pretty like this! The Eastern Shore of Virginia just doesn’t see this kind of snow regularly, so they don’t have all of the necessary manpower, equipment and funding to deal with the snow like they do in the midwest and northeast. That’s why things shut down even if we only get a few inches of snow. It’s safest for everyone. 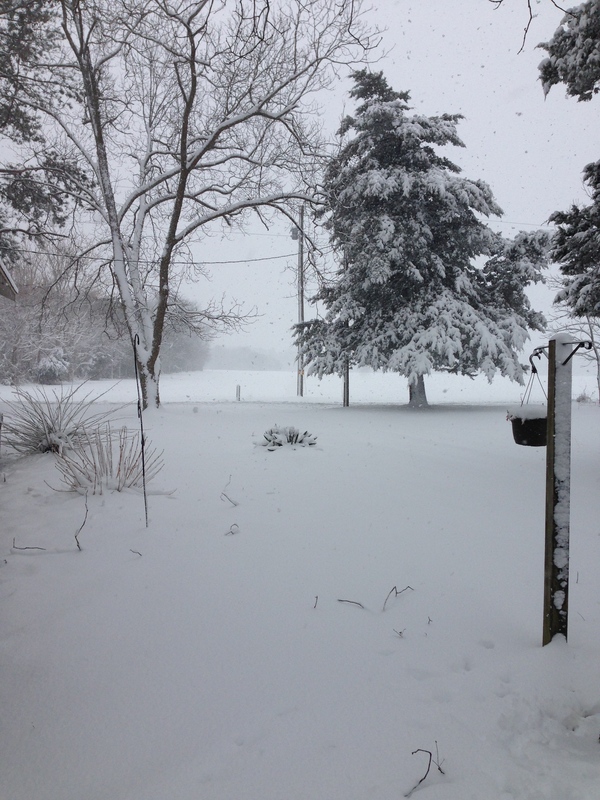 This time we got about 6 inches here in Accomac, with more on the southern end of the shore. 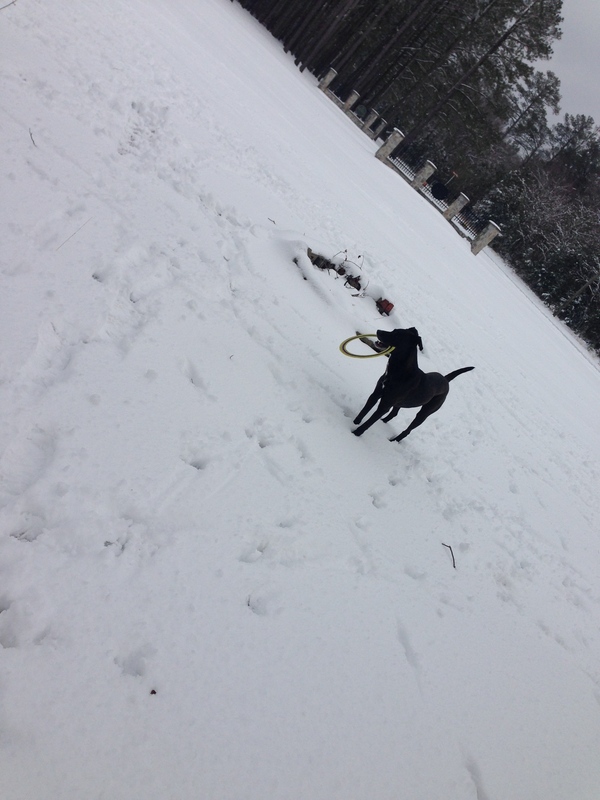 Health care workers, including Animal health care workers, can’t take snow days. There are people and animals that need tending to no matter what else is going on in the world! I don’t mind it one bit. It’s what I do and it’s what I love. I work only a couple of miles from home, and I have a 4×4, and I have a lot of experience driving and dealing with loads of snow being from Northern Illinois. So when we have days like this, I usually (not always, like last week) am the one that can make it in to take care of the animals. I was able to make it in safely this morning, took care of all of the boarding dogs and cats, and our one sick dog. Then I called to inform our already scheduled appointments that we were going to be closed for the day. Most of the clients were not going to even try to make it anyway, but many of them would try if we were open. Unless it was a dire emergency, it was much safer for our clients and staff to stay home. Another coworker, Jessica, lives about as close as I do and has a 4×4 as well, so we split the workload for the day. She agreed to go in to take care of the critters this evening. When I finished with the morning’s rounds and got the schedule in order for the rest of today and for tomorrow, it was time to head home. That’s when my snow day began for real! When I returned home it was still snowing pretty heavily. Chris and I went out for breakfast and coffee at the Club Car Cafe in Parksley. After that we went to the grocery store, because the best time to shop at the grocery store is during inclement weather! NO LINES! Awesome! I got my grocery shopping done for most of the weekend! Then we came back home and started having fun. 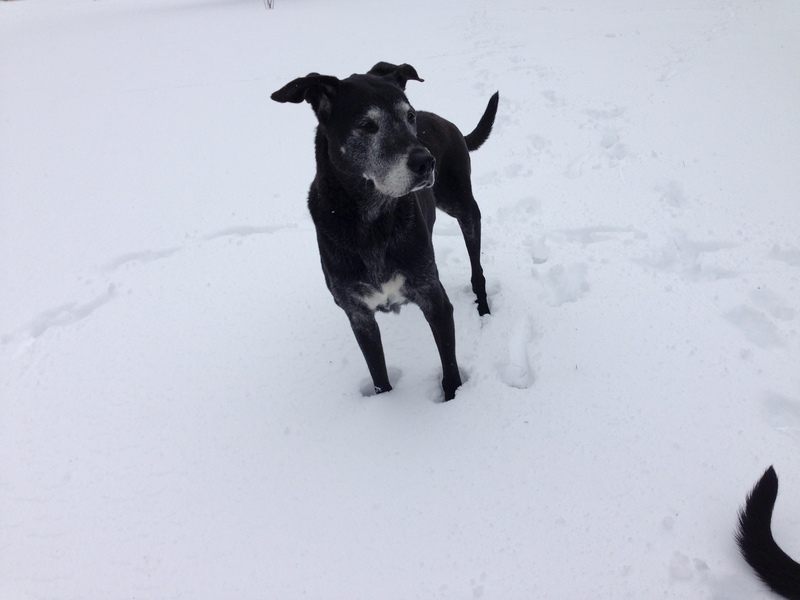 CJ loves the snow; Chompers does too but his decrepit body does not. I didn’t go for a snow run today like I did last week, only because today was a crosstraining day for me anyway, and I am off tomorrow. Tomorrow is supposed to be about the same as today, sans the snowfall, and the road should be plowed by then so the “fair weather” runner in me chose to keep with my original plan of running on Friday. I choose my battles. The kind of fun we had today was playing frisbee in the snow with CJ, going for a snowy walk down the lane, and just hanging out and having fun together as a family. First let me point out that I am writing this as I sit here during the NoseWork Trial “down time” so I apologize if it is a little scattered. I just write what I think when I think it after I write about the actual happenings. CJ had his 4th NW1 trial today. We all drove to Waldorf, MD last night for the event. It was about a 3 hour drive, and we made it without incident. The morning of the trial the outside temps were in the teens, but it wasn’t too windy and wasn’t raining or snowing (our last trial was in December 2014 and it rained, no, POURED for the majority of the event) so that was nice. The trial took place at the Charles County Fair grounds. By the time we got checked in, did the walk-through and briefing it was about 10AM. The mercury had risen a few degrees, but I still am glad that I packed my snow suit and snow boots because it was pretty cold, and the ground was covered in about 6 or more inches of snow. For the morning runs, they did both groups A & B at the same time per element; Group A did vehicles while Group B did containers, then swapped. CJ and I were B7, so our first run was containers. The room was cool, open, vinyl tile covered, and the boxes were arranged in a simple pattern of 3 per row in 4 rows. The last trial we did, the rainy one, CJ missed containers because I “jumped the gun” and didn’t even make him check out the other boxes and took his weak alert as an “ALERT!” I Blurt-Alerted, they say. Today, we crossed the start line, he zig-zagged through about half of the boxes, alerted on one but I made him move along and check out some more. He checked out the box next to the one he alerted on, then went straight back to the original box and gave me a very strong alert. I called it and…YES! Woot! Now 3 more to go. Exteriors and Vehicles tend to be his worst, but we haven’t missed interiors in a trial yet so if we do miss an element today, that will probably be the one. We shall see! Vehicles searches started rolling around 11:30AM for Group B. By the time it was our turn the outside temperature had risen a few more degrees, but there was a longer wait to this element than there was for the containers search, so it was pretty darn cold! 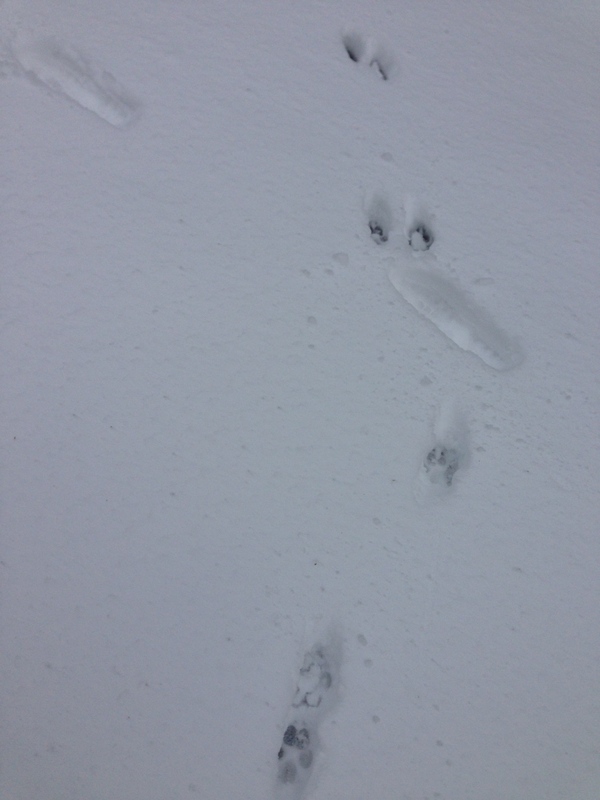 I felt the worst for CJ though, since his poor paws had to be standing on the frozen ground while we waited. Then, our turn came. CJ did his usual “I have to check everything out before I can search” thing. He does. He has to scan the room, check out what’s going on here, who’s that person over there, etc. Once he gets that out of his system, he generally starts going to work. He didn’t do that in the containers search which surprised me. Even though I know he does that, I still start to get a little anxious because 30 seconds feels like minutes and you only have a certain amount of time to find your hide (typically 3 minutes). Finally he started to actually search the vehicles. He got it! It was in the wheel well of the very last car. He gave a nice, strong alert. I was very proud of him. When we got back to the car after CJ’s container search, Chris asked how he did. I told him he missed. I don’t know why, I just suddenly thought it would be fun IF CJ gets his title to surprise Chris. We’ll see how the afternoon pans out though. It might not work out as I’m hoping it does. CJ and I just finished our last 2 elements. Exteriors first, which is typically his least successful element. Then Interiors, which he has never missed…thus far. The staging for these last elements was lengthy and cold and snowy. Poor CJ actually started shivering while we were waiting so I hugged him as we waited…I know, how sweet! The snow was getting gradually more and more heavy so that made things pretty, but wet! When we finally got up to the Exterior element CJ was ready to go! He checked out the area in general, then went straight to work. This was definitely his best exterior ever; he got it, yes, but he didn’t “lollygag” as much as he usually does. I think he was ready to be done. 3 for 3! Then it was off to Interiors immediately following exteriors. The interior element was a room with some tables and chairs, a plastic planter on the floor, covered electrical boxes on the wall, and a table that had a bunch of stacked plastic planters with dirt and wilted plants in them. CJ does best off-leash when it comes to interiors so I let him off this time as well. He ran in the room, trotted and sniffed around then saw someone friendly over on the other side of the room and went up to greet her, but she didn’t react, so he gave up and started searching again. He sniffed one of the tables and a few chairs, then he noticed someone else on the opposite side of the room that he thought he might like to meet, but that person didn’t react either, so he went back to searching again. He showed interest in one of the covered electrical boxes on the wall, but quickly passed by it. Then he went by the chair that was up against the same wall that had the covered electrical boxes and showed some interest, sniffed it again and sat down. “Alert!” I was waiting to hear Yes! or no. Instead I heard “Where?” I thought for a second, “what do you mean ‘where’?” Then I pointed and said “on the chair.” Vague I know, but he had this! And he did indeed! 4 for 4 on the 4th try! It was difficult to hide my excitement from Chris before the debriefing and awards ceremony, but I did. I overheard him chatting with other competitors about CJ and his many failed attempts at an NW1 title, and how he missed containers and how 75% was still a “passing grade,” and other comments. When the guy sitting next to us received 2 ribbons for his dog having the fastest times for two of the elements, Chris commented to him (in a goofy, joking manner) about how his dog (meaning CJ) will never earn one of those ribbons. I turned to him and laughed and told him “you’re going to eat those words one day!” He just shrugged and said he was just kidding. I knew he was. What he didn’t know was that I’d been “kidding” with him since 11:00 AM. This trial was a very successful trial for about two-thirds of the competitors, and 7 competitors and their dogs were Pronounced! The judge for the exterior search was amazed because there was a 100% pass rate for exteriors. The teams at this trial were amazing, and, as usual, we met some more really fun and interesting people. We even saw a few people we have met at previous trials. This is why I love the sport; it’s a great way to have fun with your dog, it teaches you how to read your dog’s body language in ways you never considered, and the NoseWork community is pretty wonderful. When they started presenting the award ribbons for the dogs that titled, CJ and I were the second team called. Chris gave a little bit of a confused look and when I looked at him while I was getting my picture taken with CJ’s ribbon I couldn’t control my laughter. The rest of the people in the room must have thought I was nuts. When I sat back down, still laughing, Chris said “I thought you had to get all 4 elements to get a title.” I said through my laughter “that’s right.” Then got myself together enough to explain to him how I’ve been misleading him all day. He then nodded his head and said how it all (the events of the day) made sense now. It was all in good fun, and now he’s got something to use against me when he needs it! Allow me to go back in history for a moment. Our second NoseWork trial was in Cobleskill, NY in May of 2014. CJ missed both vehicles and exteriors at that trial. 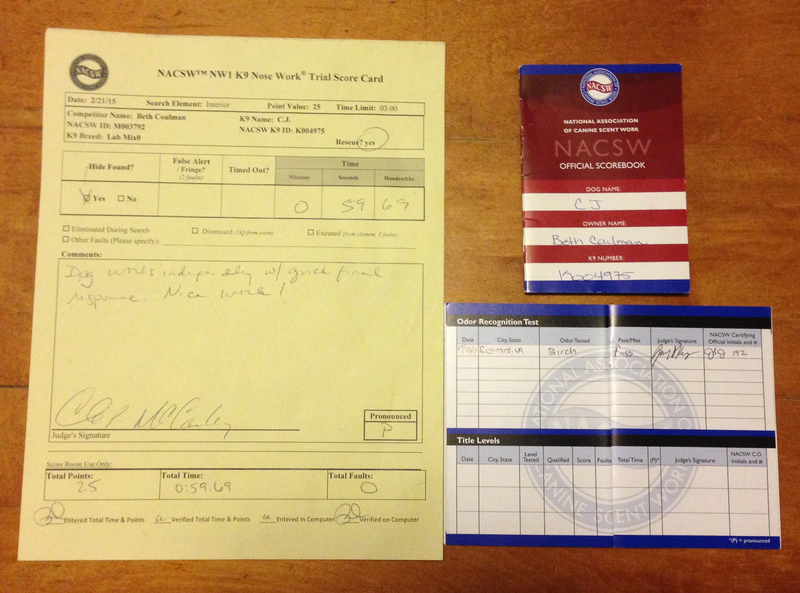 All NACSW registered dogs have a scorebook where all of their ORT (Odor Recognition Test) and Trial results are logged. At the end of each trial all competitors receive score sheets, one for each element, that has the result of the element (Pass/Miss), the judge’s notes and the time it took for the dog to find the hide. Competitors also get their updated scorebook returned to them at this time. I always look over my score sheets because it is very useful to read what the judges thought of how you and your dog worked as a team, and it’s neat to see how much time it took for your dog to find the hide (because 3 minutes feels like an eternity when you’re searching in a trial!). I don’t usually look at my scorebook because, well, I know whether or not my dog passed. A few days after the Cobleskill trial I happened to look at my scorebook. I had to do a double-take when I saw that it was written “Yes” in the “Qualified” box and that his score was 100% with 0 faults. Ummmm. 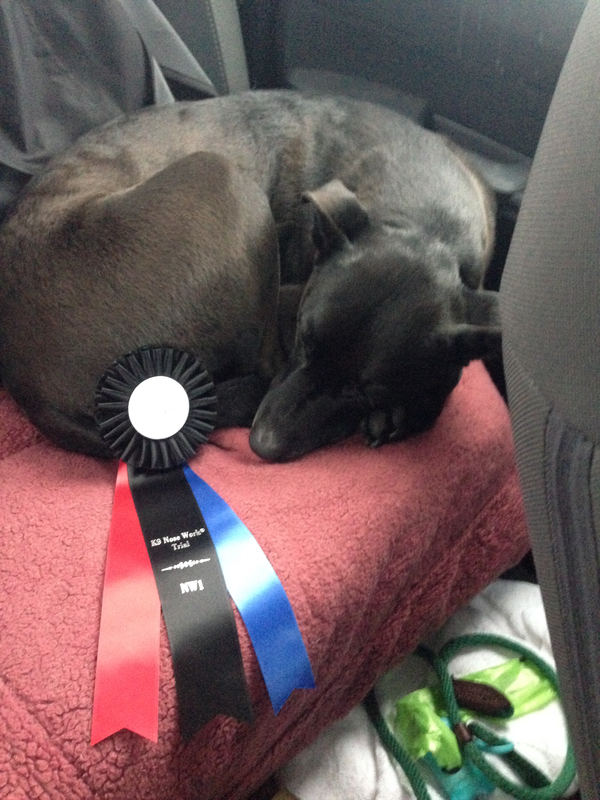 My dog 1) did NOT qualify, his score was 50% and he had 2 faults. The scorebook isn’t anything really “official,” the score sheets are what gets sent to NACSW to record your dog’s trial results. So I just laughed and was later able to have my scorebook corrected. When they called “CJ and Beth,” part of Chris’ puzzled look was due to the fact that he thought they (the NoseWork score room) screwed up again. This made the entire ruse that much more amusing. And it made my trying to convince Chris that CJ actually did title that much more difficult. After the post-trial festivities, we found a PetCo on our way back to the hotel. We had to stop and let CJ pick out whatever he wanted. He got a whole pound of biscuits, that he will graciously share with his brother Chompers when we get home, and 2 plush squeaky toys. CJ didn’t get Pronounced, and he didn’t get the fastest time for anything. What he did get is a PR for him. And that is pretty awesome! He got his fastest overall time, and did remarkably better with both interiors and exteriors. I’m so proud of him! All I know is that I was busy doing my crossword puzzle as I always do during these things when Beth came back to the truck full of “Good puppy!” and “Way to go!! !” but also slipped in “He missed on containers!” Why would I question it? She still showered him with attention even though they weren’t going to title, but I chalked it up to over-doing the positive reinforcement after a failure. Plus I was trying to figure out a tricky twist in the crossword I was doing at the time – I can get selfishly OCD that way with puzzles. After that I did talk to other folks at the trial, and since ‘containers’ were in the first half, I was under the impression that CJ could, at best, get a 75% on this ‘test’. So i made comments like, “It’s OK CJ, 75% is better than I ever did in school!” and even consoling others who also had a dog that didn’t pass this time. Then I hear a name called for “CJ” and I looked around, thinking someone had named their dog the same as us. Of course that was followed with an, “and Beth…” and before I could think of anything, my own Beth hopped up and got her ribbon. Because of a previous mixup from the NoseWork group in Beth’s booklet, all I thought was that they’d screwed up again. But I was confused as to why Beth would get an award since CJ missed containers, but when I finally realized she’d been f’ing with me since 11:00 am, I had to admit she got me good. 2) She got very secretive about her blog that she was typing up, though she didn’t upload real-time. She hid it but I didn’t press her for info. Well, there was no 3C – it didn’t even occur to me that Beth would keep up a lie for even 4 hours like that. Now how’s that for blind faith from a non-four-legged y-chromosome-having companion in this day and age? Today I decided to get in another training run. 4 miles with my running buddy CJ! My training schedule had me going out tomorrow, but I looked at the weather report and, yeah, I think I won’t be running tomorrow! I know there are many runners out there that regularly run in temps well below freezing, and I applaud you! But I absolutely abhor running in the wind, especially the freezing wind and the next two days are supposed to be just that. So, I chose to run today and come tomorrow I’ll be happy to do my indoor cross training. 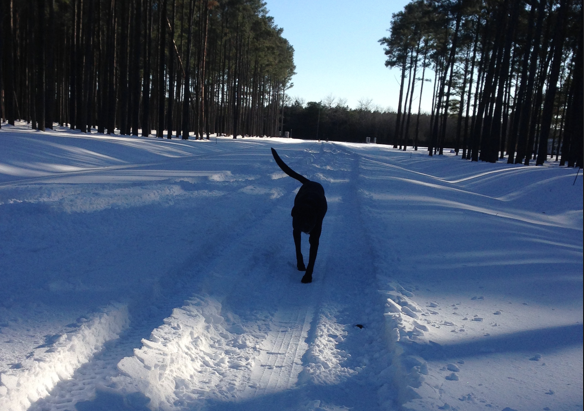 The roads were plowed finally late last night so today’s pace was much improved over yesterday. 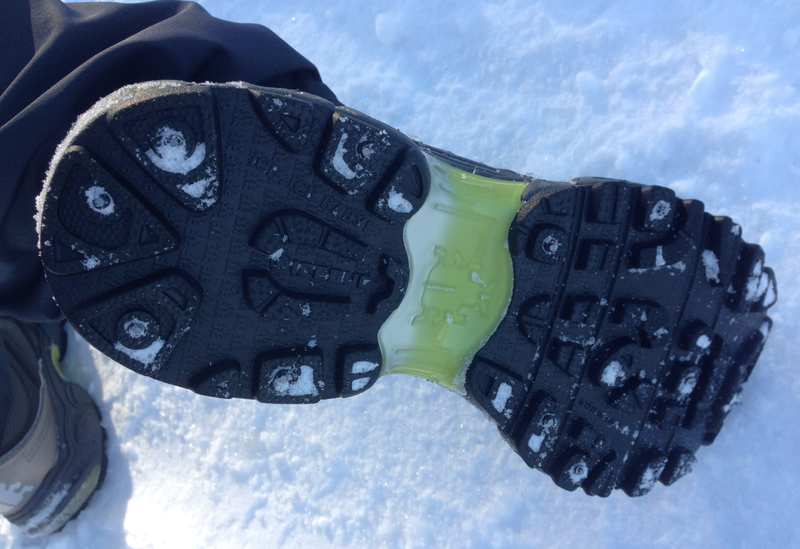 The packed snow and areas of slush and ice would have been much more difficult to navigate if I didn’t have my Ice Bug shoes. I really do like them. I’m thankful that I don’t have to use them very often, but very happy that I have them when I need them. The bottom of my Ice Bug shoes. Hard to see but they have carbide tip studs in the soles to aid in traction. They really work well! This weekend’s “long run” is going to be less than ideal as well. The weather is supposed to be warmer, but I have to go out of town so I’ll be spending some time in a hotel in an unfamiliar area. Therefore, I will most likely end up doing my long run on a dread-, er…treadmill. I don’t like running on treadmills because 1) I find it extremely boring, and 2) when I get off after completing a run my legs feel like rubber. But, I do what I have to do and will do my best to get all 9 and 1/2 miles completed on Saturday evening. Maybe the hotel will have a hot tub! Then it will all be OK.